An original formula that makes FRESH MARKET a success: in a single day and in the same place, the event offers conferences, exhibition spaces and B2B meetings. The main objective is to enable producers and suppliers of fresh Fruits & Vegetables to meet representatives of regional and international distribution chains and wholesalers. The 11th edition of FRESH MARKET was held on 27 September and brought together 150 companies, confirming once again the excellence of its formula. Formula based on the needs of merchants and suppliers in the Fruit & Vegetable industry. In the same place and in a single day, the event allows to meet representatives of several dozen retail chains, importers and exporters based in Poland or abroad. Making contacts, strengthening cooperation, exchanges, product and service exhibitions, meetings and discussions with experts in the sector, information on the current market situation and forecasts for the coming year. Each year, more than 90% of participants consider that attendance at the event is very useful and effective. 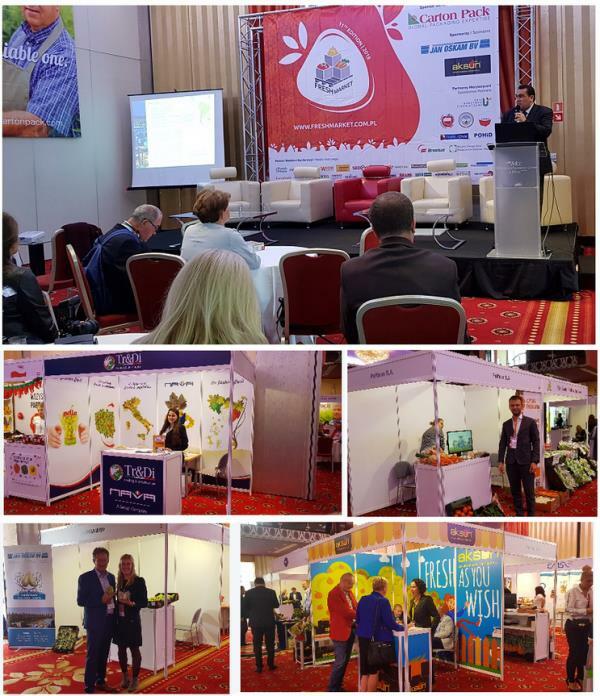 FRESH MARKET 2018: Conference area with Mr. Carvajal (ASOEX, Chile), exhibition area with stands of the companies Aksun (Turkey), Nava (Italy), Polfarm (Poland), Jan Oskam BV (Netherlands).